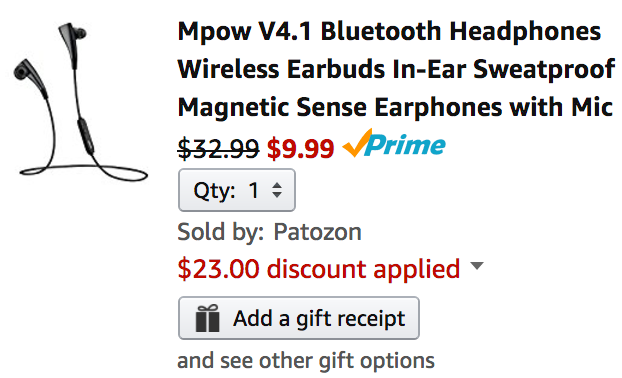 Patozon (99% positive feedback from over 113,000) via Amazon is offering the Mpow V4.1 Magnetic Bluetooth Headphones with Mic for $32.99, but if you use the code OVDVN7JA the price drops to just $9.99 Prime shipped. That’s a $23 discount and the lowest we’ve seen for them at Amazon. These sweat-proof earbuds let you answer the phone and play music. Also, it has up to 7 hours of continuous talking/music time and you can connect two devices. Rated 3.8/5 stars by 295 Amazon shoppers. The earplug can be magnetically attached to each other back-to-back, forming a loop around your neck. It allows you to play/pause the music on your device or answer/hangup phone calls by separating and attaching the headphones. Advanced Bluetooth V4.1 technology and Apt-X Technology allow you enjoy the original quality and accurate music in deep bass. The updated Bluetooth technology provides strong signal connecting with Bluetooth-enables devices within 30 feet, faster and more efficient than Bluetooth 4.0. Adopted high-performance polymer lithium battery, the Mpow wearable wireless headphone can last up to 7 hours while listening to music or talking on the phone. This powerful rechargeable battery has up to 175 hours of standby time. Easy and fast connect two devices at the same time and allows to automatically connect after paired successfully for the first time, so you won’t miss any important calls. Universally compatible with IOS and Android smartphones, tablets, and other Bluetooth-enabled devices. Such as: iPhone6, 6 plus, 5, 5s, 5c, 4, 4s, ipad 4, 3, 2, iPad Air Mini, iPod, Samsung Galaxy S6, S5, S4, S3, Galaxy Note 4, 3, Android and most Bluetooth-enabled phones.